Yellow stylized Kanji character of Yama of Yamanashi in the center of white outlined Mt. Fuji on purple colour as grape is popular product of Yamanashi. Adopted 1 December 1966. Picture an old mountain, well rounded by erosion. Place upon it the symbol for "forest" (itself representing three "tree" or "wood" symbols combined), and you have a picture of Yamanashi and it's flag. The prefecture flag was adopted on Dec 1st 1966 by Notice No 262. The purple flag has white and yellow flag emblem which is different from the prefecture emblem. It is stylized kanji 山Yama of Yamanashi in yellow in Mt. Fuji in white. The purple color stands for local speciality grape, the white color for purity and the curved line for the flexibility and unlimited improvement. The prefecture emblem was adopted on Oct 1st 1966 by Notice No 219. 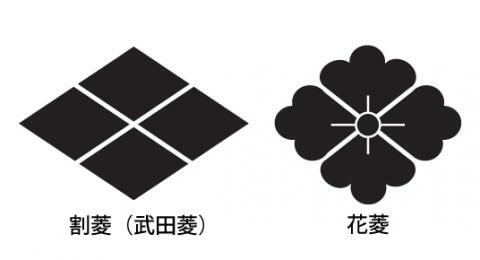 It is stylized kanji 山 Yama of Yamanashi in a combination of four Mt. Fuji and former Domain's lord Takeda family crest water caltrop in a diamond shape which represents reconciliation and cooperation.